Life lessons learned with Horses. 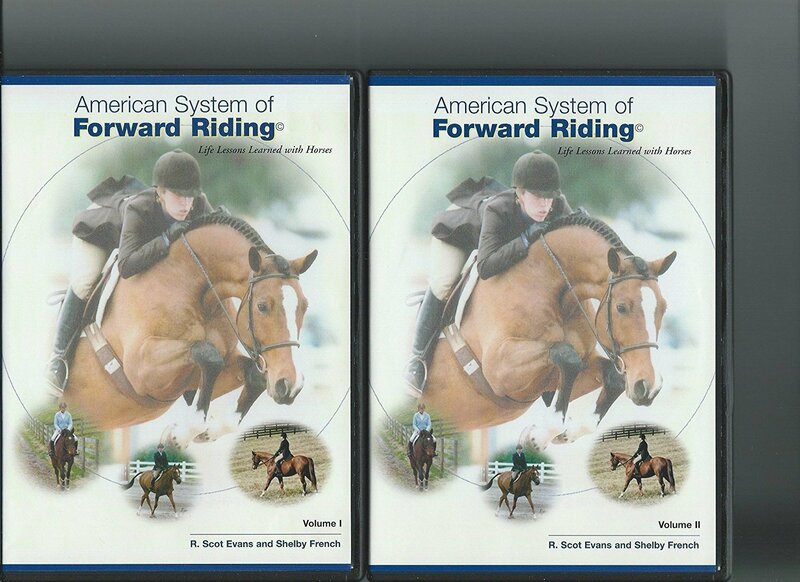 This American System of Forward Riding DVD Vol 1 and 2 includes 4 DVDs and Volumes 1 and 2 Workbooks. Price includes tax and shipping. This new educational series produced by R. Scot Evans and Shelby French teaches “the way forward,” a process that helps riders produce quality in their work with their horse. The series of DVD’s and accompanying workbooks provide models and teach techniques that promote greater understanding and connection between horse and rider. The American National Riding Commission has provided rider testing and awarded rider ratings using a multi-level system for half a century, but in the past riders had to test at an ANRC rating center, national equitation championship, or equitrial in order earn a rating. That has changed with the publication of the “American System of Forward Riding: Life Lessons Learned with Horses.” This new educational series allows riders to use the DVD’s and workbooks to progress through a series of exercises and tasks with their horse, then apply for an ANRC riding level by videotaping their performance and submitting it to an ANRC Instructor for evaluation. The American system of forward riding is used by many top hunter-jumper, eventing, and even dressage riders today. “I use the American system of forward riding in teaching my students and training my Grand Prix horses. I used the system in preparing for the Olympic Games in Sydney,” states veteran international show jumper Laura Kraut. This system is useful to riders at every ability level. The “American System of Forward Riding” series makes the system accessible to riders who may not have a trainer or instructor by breaking down riding theory and skills into fun and useful exercises. “The DVD series and workbooks are meant to be used at all levels of riding, whether one is interested in creating solid flatwork, developing a solid foundation of aids, or targeting a specific competition or goal. This is the ‘way forward,’ where everything begins in riding horses,” says co-producer and USEF “R” judge R. Scot Evans. The ANRC awards five riding levels. Volume I provides tools for the Introductory Level and Level One. These DVD’s focus on stabilization of the horse and why it is effective as a tool for both horse and rider, as well as development of the rider’s position that is necessary to create a stabilized horse. Volume II instructs the rider in Levels Two and Three and focuses on developing stabilization, putting the horse in front of the rider’s leg, and riding towards contact. Additional volumes will teach exercises and skills at Levels Four and Five. This system of training is based on the concept that one takes small steps which lead to the goal: partnership and better communication between horse and rider. The “American System of Forward Riding” series will be useful to any student of the horse, whether a professional, amateur or pleasure rider. The series also has applications in the riding academy and college equestrian program, as it provides the framework for courses in riding, training and schooling the American hunter. Each volume sells for $50, which includes tax and shipping fees. Both volumes are available at www.anrc.org.